The Brazilian, despite his differences with Sampaoli, scored in the comeback of Santos against Corinthians. The Croatian has two days of Premier without a single minute. Odegaard (20) . The Norwegian inspired little in the Vitesse match at Utrecht's house, like the rest of his team, who did not miss the draw (0- 0). Important pinchazo for the Nordic team, which is still fighting to enter the Europa League. Odegaard played the 90 minutes. Theo (21) . The left back on loan at Real Sociedad rested on this day and did not dispute a minute in the visit of Eibar to Anoeta (1-1); the young Aihen Muñoz played in his place. Mayoral (22) . Bad day for the striker on loan in the Levant: his team lost in the derby against Valencia in Mestalla (3-1) and he went to the bench, relegated by Roger and Morales in the Granota attack. He had 22 minutes in the second half in which he could not score and took a yellow. James (27) . Second day of Bundesliga followed in that the Colombian part of substitute at Bayern Munich. In the resounding 5-0 to Dortmund did not have a minute; against Fortuna in Düsseldorf (Bavarian victory 1-4) Kovac at least gave him ten minutes in the second half. It hurts the scheme 4-3-3 that has been using the technician and the good moment of Thiago, Müller and Javi Martínez. Rodrygo (18) . 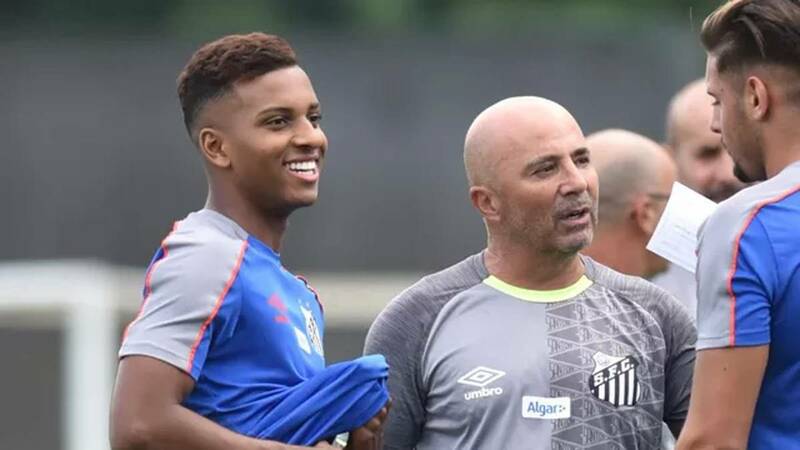 His relationship with Sampaoli, Santos coach, does not go through the best time, but He still had a good role last week: against Corinthians, in the semifinal round of the Paulista Championship, he came out in the 46th minute and helped his team reach the session. Once there, he scored his penalty, but Santos ended up succumbing. Later, he started the round of the third round of the Brazilian Cup against Atlético Goianiense: after the 1-0 defeat in the first leg, Santos came back and qualified 3-0; Rodrygo made the second, of very powerful volley entering on the right, and left in the 82'. Kovacic (24) . Complicated week for the Croatian, with his third substitution followed in Premier and his second match without playing in the league english Sarri did not give him a minute against Liverpool. Yes it is true that days before he started in the first leg of the Europa League against Slavia Prague, playing 68 '. Critics in England begin to be forceful: FourFourTwo magazine cataloged him this week as "the most useless player in the Premier" . Óscar (20) and Lunin (20) . The two were left without even being summoned yesterday with the Leganés by the fear clause of Real Madrid. Achraf (20) . The Moroccan, recently operated from a fracture in the fifth metatarsal of the right foot, is still recovering and will no longer play this course. Diallo has taken his place on the left side and Dortmund, who won 2-1 at home to Mainz, hold Bayern up for the Bundesliga title. Lucas Silva (26) . Cruzeiro did not play a minute in the first leg of the Mineiro Championship against Atlético Mineiro; his team won by 2-1.